In days gone by, the centrepiece of any recording studio was the mixing console. You couldn't have a studio without one, and for preference it had to be huge. Then progress was made: the 1991 unveiling of Pro Tools marked the beginning of the transition from mixing by console to mixing by mouse. And indeed it is entirely possible to mix using a mouse–and–keyboard interface. Even the largest Pro Tools rig with a gazillion tracks can be controlled via an object no bigger than the palm of your hand. But there is a drawback. If you have ever had the opportunity of mixing on a conventional analogue console of a decent size (and these days many people haven't), then you will know the joys of mixing instinctively. Music emanating from the monitor speakers enters the brain, filters through the arty, non–analytical, non–technical regions, and almost without conscious thought the fingers move the faders, and reach out and twist the rotary controls. When you mix with a mouse, you have to imagine the sound you want to achieve, then engage the brain's number–crunching central processor to make it happen. And there is one thing that the mouse can never do, and that is balance one sound against another — the level of the bass versus the low–frequency EQ of the rhythm guitar for instance. This is a technique that old–school engineers will know very well indeed. With a mouse, you can only control one parameter at a time. One more example? Have you ever seen a highly experienced engineer drape his or her fingers over the faders and control several at the same time? The mouse would retreat back into its mouse hole, curl up and die. The above operational reasons are enough to justify using a control surface in preference to a mouse, even though the control surface may be literally thousands of times the price. There is another reason... Although it is possible to make a complete multitrack recording and mix entirely within Pro Tools, a Pro Tools system in itself doesn't fully equip a 'proper' recording studio. And by 'proper' recording studio I mean one with a separate control room and recording area, where you can record a band in an efficient, productive manner and mix efficiently, too. Among other features, a talkback mic will be needed; a listenback mic is nice. There will be alternate sets of monitors to be switched, external stereo inputs to listen to. Oh yes, and you will need to have your head up and be actively communicating with the other people in the room, not focusing your concentration deep into the monitor screen. An Analogue Console? From Digi? Any analogue mixing console will have a good number of microphone inputs. We have come, over recent years, to see the microphone preamplifier as an outboard device. But the C24 puts it back where it belongs: inside the console. The C24's 16 preamps boast a frequency response that is flat within 1dB up to 100kHz, equivalent input noise of –127dBu and total harmonic distortion plus noise of 0.004 percent at 1kHz. These specs, though we might have liked to see distortion figures measured up to 20kHz, spell C–L–E–A–N. And of course there is no reason why you can't connect your boutique preamp as well. Naturally, these inputs can be switched to accept line levels or high–impedance instrument inputs too, and there is an additional eight–input line–level submixer, which we will look at in due course. The C24's analogue interfacing uses mainly DB25 multi–pin connectors.You might expect microphones to connect to the C24 via XLR connectors, but this is not so. 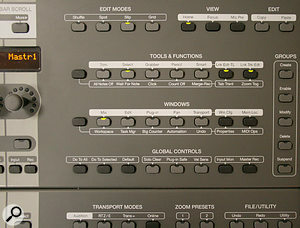 The majority of inputs and outputs are on DB25 connectors. Since there are 13 such connectors you should make a generous allowance in your budget for cabling, or prepare for a marathon soldering session. You can, of course, buy adaptor cables from Digidesign! The C24 has plenty of inputs; it has plenty of monitoring options too. 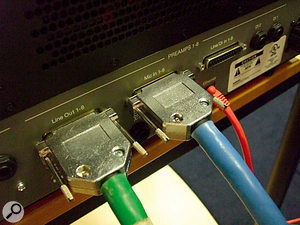 There are, for instance, connections for no fewer than four monitor input sources — two six–channel surround and two stereo. There are two cue inputs and two outputs, one of the outputs being six–channel surround too. In fact, when you think about how much I/O capability the C24 provides, it starts to look like very good value almost irrespective of its control functions. One feature that may be simple yet exemplifies the C24's dedication to traditional studio practice is the studio loudspeaker outputs. Yes: the band can listen to their take on loudspeakers (via a power amp of course) without having to traipse into the control room. Any engineer with experience of band members invading the control room will greatly appreciate this. I don't want to make too much of this one point, but it is a small nicety that anyone who didn't understand studio practice would overlook. Its inclusion demonstrates that Digidesign do indeed understand, and we can expect the rest of the facilities of the C24 to be as well in tune. Now that we know the ins and outs, let's examine how the C24 can be integrated with your Pro Tools system, and the rest of your studio. The first thing to remember about the C24 is that it is not an interface to your Pro Tools system; it works with your existing interface. So the C24 will send analogue signals to and from your Digi 003 Rack, for instance, but it is inside the 003 that the A–D and D–A conversion takes place. So your microphones will connect to wall boxes in your recording room (it's a 'proper' studio, remember!) and the wall boxes will connect to the mic preamp inputs on the C24. Your line–level sources can connect to the line–level inputs and your guitars to two separate input jacks. The outputs of the preamplifiers are analogue and at line level, and they connect to the line–level analogue inputs of your interface. Clearly, if you have an interface with only eight inputs, you can only send eight channels to it. You can route any combination of eight, though. Actually, I'm a little bit surprised not to see an ADAT optical output on the C24, but evidently Digidesign made a policy decision not to do this — they wouldn't just forget. 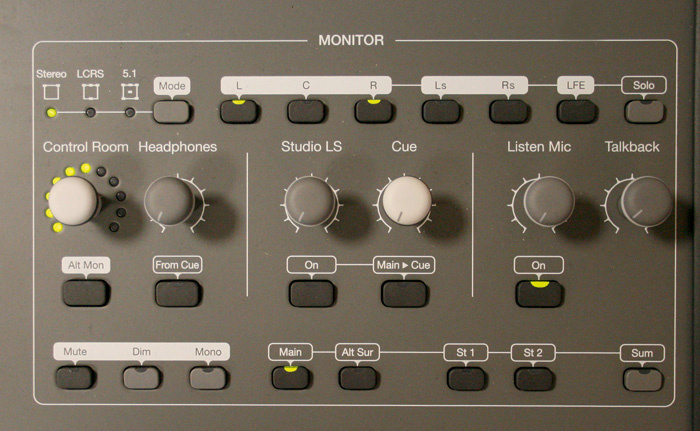 The analogue outputs of the 003, or whatever interface you're using, connect back to the Pro Tools inputs of the C24. Typically you might configure two outputs to be your stereo monitor outputs, and two more can be your cue outputs (pre–fade auxiliary sends) for foldback. Obviously, monitor and cue levels are controlled — in the analogue domain — by the C24. That's enough time spent round the back. Once the C24 is installed, you shouldn't ever want to see it again anyway. Let's look at the C24 from the engineer's point of view, which is much more interesting. The C24 has a meter bridge, as you would expect — although you might have expected it to be an optional extra, as would be more usual. Thankfully, it's built in as standard. The meters reflect the on–screen software meters, so they don't tell you anything you couldn't find out otherwise, but they are exactly where you want them to be and I wouldn't want to be without them, nor the clear timer display. Just below the meters are the controls for the microphone preamplifiers. I'm not going to be old–fashioned and carp that the gain controls are not calibrated in dB, because the preamps are fully integrated into Pro Tools and all you have to do is wind on enough gain, as shown on the meters directly above. There is of course a clipping indicator. Just one button control, which cycles through Mic, Mic with high–pass filter, Line, and Line with high–pass filter, is provided, and there's no phase button, but hey — that's the job of a plug–in! Phantom power is switched in blocks of eight preamps. Personally I don't find this slight lack of flexibility an issue but I know there are other shades of opinion on that. Refreshingly, the meter bridge is fitted as standard.You might have noticed that this is a 'C24' — note the '24' — and there are only 16 mic preamps. Well, space that might otherwise have gone vacant is used for an eight–channel line–level mixer. This has its own pair of output jacks, so you can do what you like with it — you can connect it to a pair of inputs on your interface if you like, or you can route internally direct to the monitor. I'll skirt around the channels for the moment, because clearly they will need special attention. To the left of the console you will find a lot of buttons that are relevant to automation. If you currently mix with your mouse, you probably spend more time inserting and editing automation on screen than controlling it with the faders. But when you have a control surface the whole point is to use the faders and other physical controls. Why else would you be spending all this money? So Digidesign have really gone to town on this. 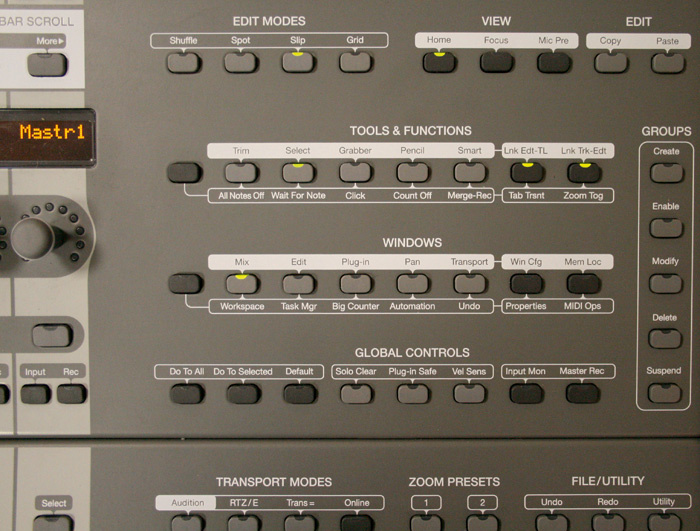 There are no fewer than 19 buttons controlling automation globally. These cover automation modes, enables and 'write to'. 'Write to' takes the current values of automation parameters and writes them to other parts of the tracks, in a variety of ways — all the way to the end, for instance. You will use it a lot when it's right there in front of you ('write to' is only available on Pro Tools HD, unfortunately). To the right of the console there is the monitor section, which is very well equipped with controls for stereo and surround monitoring, alternative speakers, cue (foldback), talkback and listenback. There is no oscillator! (You'll have to use a plug–in if you need to generate test tones.) Next come four buttons for the four edit modes in Pro Tools: Shuffle, Spot, Slip and Grid. View controls select the default view of the console (where the rotary encoders in the channels control pan), the previously selected view or a view of an external Digidesign microphone preamplifier unit, if you have one connected. There are editing buttons that pull out important features of Pro Tools into the control surface, such as Trim, Select, Grabber, Pencil and the Smart tool. You can select audio, scrub, trim and perform edits right from the console. My instinct is telling me that because editing is so easy using the mouse and the smart tool, the mouse will still find itself popular for this application. I sense that with a little familiarity one's mouse hand and one's C24 hand would find themselves coordinating very nicely on this. Consideration should be given to creating some 'mouse room' right next the C24. You won't be using the computer keyboard an awful lot, but easy access to the mouse will be useful. But, you know, I'm going to stop myself there... Doubtless, if you look hard enough you will find some function you occasionally use not represented on the control surface. But you won't be able to complain about it because Digidesign have done a pretty damn good job of placing everything you need right under your fingertips. And, by the way, the transport controls have a very pleasant, positive feel too. A comprehensive monitor section caters for surround and stereo playback systems.On a conventional analogue mixing console, the channels are vertical strips that work independently of each other. That is so here too, except that it is also possible to display and control plug–ins using the channels' LCD displays and rotary encoders spread out across the width of the console. Despite the fact that there is so much going on inside the C24 that is of an analogue nature, the digital side of its character brings in multiple–function controls. This part of the operation of the C24 will require a learning process. Clearly, in an ideal world it is always preferable to have only one function per control. The human brain responds well to that. But the functionality of Pro Tools is immense. To map that to single–function controls would require a console of enormous size. It would not be even remotely feasible on the compact C24. Let's start by looking at the facilities provided within the channel strip. At the bottom (you thought I was going to start at the top!) is the fader. I start with this because it is pretty much the raison d'etre of the control surface. I know plenty of people who do mix by dragging attractively designed, artfully shadowed graphics of faders up and down the screen, but I don't know anyone who actually enjoys working like that. Or at least they certainly wouldn't admit to it. No, the physical fader as we know it today has been around for 40 years and it just plain works. Like the faders on the C24. One of my pet peeves about mixing consoles in general is where there are buttons, usually routing buttons, around the fader area. I hate this — they get in the way all the time — and having an uncluttered fader area such as this is a pure pleasure. Digidesign have usefully calibrated the fader in decibels in the normal way, even though having this information available on–screen in theory makes this unnecessary. That's good, and shows that there is no slacking going on in Digi's design labs. The faders are motorised, of course. I think we can thank Yamaha for showing the world that motorised faders could be provided in a cost–effective unit. Before that, they cost the earth. These faders are touch–sensitive. This is significant for the automation, because the system can recognise when you have merely touched a fader and make itself ready to receive information. Touch–sensitivity is better than movement–sensitivity in this respect. 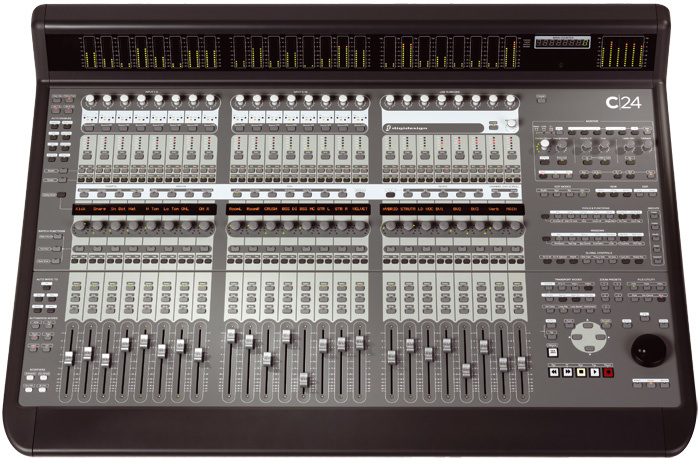 However, it is worth pointing out at this moment that Digidesign's higher–priced products have many more touch–sensitive controls, while the C24 only has touch–sensitive faders. Like many touch–sensitive faders in mix automation systems, they are prone to 'guitarist's callous' syndrome, where if you push the fader with a hard–skinned fingertip, it won't realise it has been touched. When you release it, the system will think the fader is somewhere it shouldn't be and promptly move it back. This minor niggle is not unique to Digidesign, though. I wonder if there will ever be a cure? Moving up, we have those two buttons that get pounded hard during a heavy mix session, Mute and Solo. Naturally, these buttons have integral LEDs. There is so much that could be assignable on a control surface like this, and I am happy that these buttons are dedicated to their functions. If you want to solo–safe a channel, which is a function I find myself in need of quite often, then you have to hold down the Ctrl or Cmd key of the keyboard while pressing the appropriate solo button. Indeed, there are a number of functions across the console where you need the Shift, Alt, Control or Command keys. And guess what? Digidesign have duplicated them in the bottom left corner of the C24. Very handy. The Holy Grail of using the keyboard only to fill out the scribble strip is getting closer. 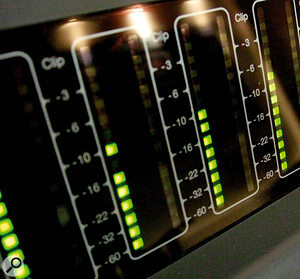 Many of the most–used functions within Pro Tools can be called up from the buttons at the top right of the console. Moving up further still, we find the Record Enable switch, the function of which is obvious. Next to it is the Input Monitor switch which, when the C24 is connected to a Pro Tools HD system, switches the channel between Auto Input and Input Only mode. Again these are useful functions to have dedicated buttons for, right where you want them (the Input Monitor button has additional functions on instrument tracks). Sooner or later, however, we are bound to get to a multi–function control, and here we have it in the form of the rotary encoder. As you know, a rotary encoder is a digital knob. You turn the 'knobby' part to achieve the difference in sound that you want, and the ring of LEDs around it relates to the setting of the knob. The rotary encoder is a far better alternative to a knob in digital audio, because you always get an up–to–date readout of the setting of the control, no matter which parameter it is assigned to. Only a company accountant would ever suggest substituting a mere knob for a rotary encoder. As you might guess, the rotary encoder has several functions. No — it has many functions. No... it has potentially an infinite number of functions... just about anything other than fader level, and there is a 'flip' mode where it can control that too. Now I need to talk about Console View and Channel View in the C24, with reference to the digital 'scribble strip' displays just above the row of rotary encoders. In Console View, the information in each of these LCD windows relates to each individual channel. This could be the track name, pan or send level, for instance. But there is the powerful alternative of Channel View, where a set of parameters for a particular function or plug–in are spread across several of the scribble strip displays, for the selected channel. Now this, to my mind, is one of the greatest challenges for control surface designers. The whole point of a control surface is to take the engineer's attention from the screen and direct it to the console. But any DAW is capable of doing so much. How can it all be presented in a clear yet comprehensive, and at the same time easy–to–use, manner? Digidesign have settled on a very acceptable solution here. During the review session at Digidesign's UK HQ at Pinewood Studios (heavens, that 007 stage is big! ), the monitor was positioned to one side for the sheer practicality of fitting everything into the demo studio, and I hardly ever found myself looking at it! This is the true test of a control surface — to what extent does it allow you to avoid using the computer keyboard and monitor? how many plug–ins did you use in your last Pro Tools Session? My personal approach to mixing is to keep things simple and only use plug–ins when strictly necessary. Well, that's the theory. In practice, I seem to find myself using as many plug–ins as the available DSP will allow. And then a few more, so that the computer's processor is buckling at the knees too. Maybe I'm exaggerating a little, but I'm sure you know the feeling. All those plug–ins, and all those parameters to control. How can they possibly be mapped onto a compact control surface in a usable way? The answer is to be found in Channel View. This is where as much of the scribble strip as necessary is used to display all of the parameters of any single plug–in you desire to view and use. So if you have 50 plug–in instances running, you can quickly home in on one, see all the parameters and make the changes you want. The transport section is well specified, and editing can easily be accomplished using the jog/shuttle wheel and associated buttons.Sounds good so far? Well there's more, because Digidesign have provided quick access to the two processes that are used most often: EQ and dynamics. There are shortcuts to the first EQ and to the first dynamics plug–in in the insert chain. The buttons are right there in every channel. So yes, EQ in/out is something you might use a lot. It's right there for you. Granted it takes a little longer to get to the parameters of any other plug–in, but the advantages of going press–press–press and getting there while chatting to the band, compared to squinting at the monitor and applying all your concentration, are considerable. I have to be clear on an important point here. There is a learning process to complete, and you won't be able to insert and operate plug–ins without the manual. I had Digidesign's product specialist show me button–by–button how a plug–in is inserted, and how a bus effect is created. These are straightforward processes using the mouse and monitor. Doing it with the C24 is also straightforward — when you know how, and when that knowledge has become embedded in your fingertips. Designing a control surface to handle this amount of complexity is far from easy, and if you decided not to buy the C24 because you saw a demo and you thought this part of the operational process looked too difficult, you would be making a mistake. You just have to get over that first hump of the learning curve, and then it will be plain sailing. There is so much capability in this control surface that I couldn't possibly go through it all in the space available here. And if I did, I would inevitably end up telling you how to operate the C24 rather than trying to give you as accurate a perspective as possible, to allow you to make an informed purchase decision. You can learn how to operate it from the manual. One of the key questions in making such a purchasing decision is what is the worst feature of any particular unit? What is the potential deal–breaker? 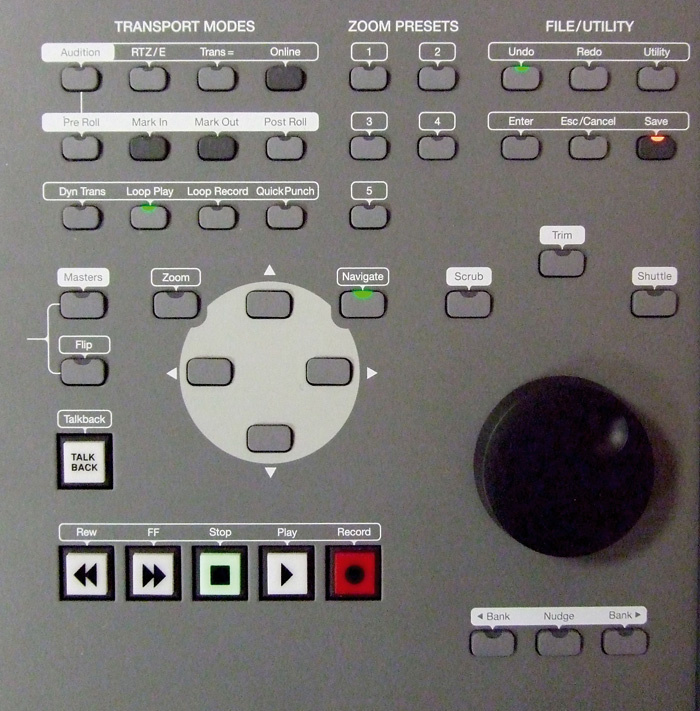 Like other control surfaces, the C24 can control many more tracks than it has channels. Tracks can be paged, nudged or cascaded with the scrub wheel, so that you can quickly access as many tracks as your system can record. Naturally, faders will move and the LED rings around the rotary encoders will update as you do this. If you are new to control surfaces, then you will appreciate this. But you will soon realise that in any mix, some tracks are more important than others. The lead vocal is aways of prime importance. So you would like to be able to lock this to a particular, close–by, fader while the other tracks are paged or nudged. But, on the C24, you can't do this. I know exactly why this is so — because Digidesign need to differentiate this medium-range product from their premium products. I doesn't stop me wishing for a feature that would have cost almost nothing to provide. In summary, however, Digidesign have done an excellent job in mapping the incredible power of Pro Tools to a compact and reasonably affordable control surface. Granted, some aspects of it need time to be spent on learning them, and you can't lock certain tracks to certain channels, but overall this is a bold step forward in control surface design. In return for your investment, you will be mostly freed from your monitor, your fingers will be flying instinctively around the console, and you will be much more 'head up' and involved with musicians around you. There is a lot of value to be had here, and the Digidesign C24 warrants your serious consideration. Digidesign have a lot of experience in control surfaces, and they make an impressive range. At the top end is the Icon, which integrates Pro Tools into the truly massive D–Control or merely large D–Command control surfaces. 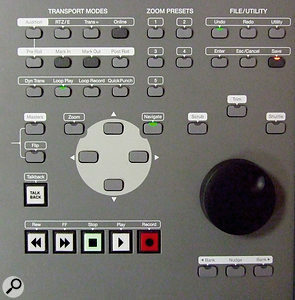 You have to see the D–Control in the flesh to realise that Digidesign's intention was to grab the large–format console market. "Is your SSL getting a bit long in the tooth? No problem, a D–Control will replace it nicely, and its size will impress your clients just as much." The D–Command is smaller, but still satisfyingly chunky. At the compact end of the range (it doesn't sound right to call it low–end) is the Command 8, which features just eight faders in a desktop package. And then there is Digidesign's earlier generation of control surfaces, from which lessons have been learned. Perhaps you have a Pro Control, or a Control 24. If so, you might be wondering whether it's time for an upgrade. 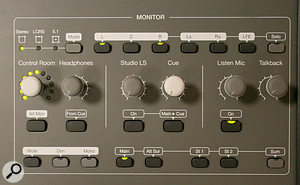 The Pro Control, which was discontinued in 2004, was Digidesign's former flagship control surface. If you have one of these, the D–Command or D–Control is your upgrade path. If you have a Control 24, which is still in some dealers' warehouses, then the C24 will definitely be your upgrade. If you find all these 'Controls' and 'Cs' confusing, well so do I. Don't worry — all will be well once your shiny new control surface is installed. All rotary controllers on the D–Control and D–Command are touch–sensitive, so true touch automation is possible. Only the faders are touch–sensitive on the C24. The D–Command and D–Control have dedicated EQ and dynamics sections. However, they are physically very much larger consoles. The D–Command and D–Control allow custom fader groups. It is possible to group non–contiguous channels, or lock certain channels to certain faders while other faders are paged. The D–Command and D–Control allow plug–ins to be mapped to faders. The D–Command has two and the D–Control has six rotary encoders per channel, allowing immediate access to more parameters. Perhaps a good summary is that the D–Command and D–Control are both like mixing consoles with a DAW built in, while the C24 is a control surface for a DAW. Digidesign's experience in control surface design shows. Some operations will require a learning process, but the massive capability of Pro Tools makes this an inevitability. For a Pro Tools user, buying a control surface is a matter of 'when' rather than 'if'. With the introduction of the C24, 'now' could be the time!